When it comes to cooking for my large family, I like to use a cookwear brand that I know and trust. 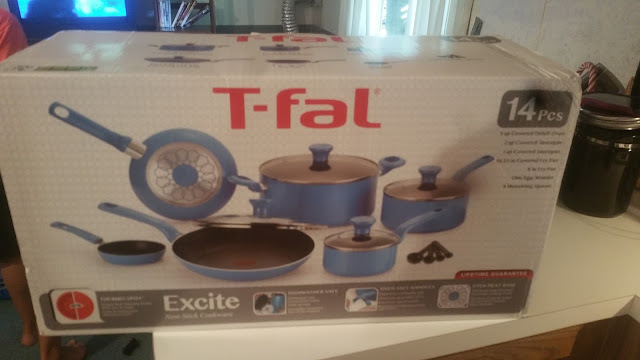 In comes T-fal. With 14 amazing pieces there is a pot and pan that fits all of my needs. 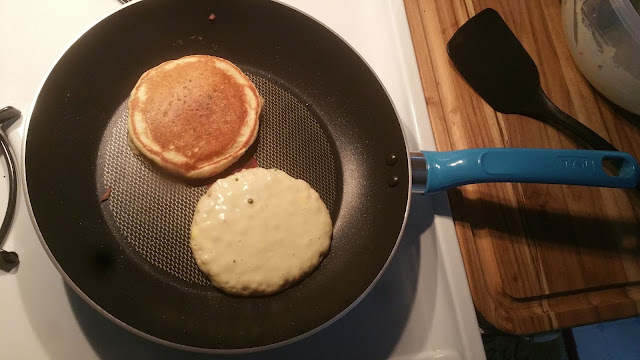 The 8" fry pan is the perfect size for me to make my kids pancakes without them sticking the the pan! The T-fal Excite Non-Stick Cookware Set is a high-quality, ultra-durable cookware set featuring a stylish and streamlined presentation, with an innovative construction. Available in both Aluminum and Stainless Steel, the sets feature T-fal’s patented ThermospotTM technology that indicates when the pan is perfectly preheated to seal in flavor and prevent burning. The set is dishwasher safe and guarantees durable non-stick performance during heavy use while still allowing for fast, easy clean-up. The Aluminum set is available in Cherry, Tangerine, Grape, Turquoise, Kiwi, and Berry (NEW! – Available Spring 2015). Features new ProGlide Non-stick. The 14 piece aluminum set includes: 8" Fry Pan; 10" Fry Pan w/ cover; One-Egg Wonder; 1 Qt. 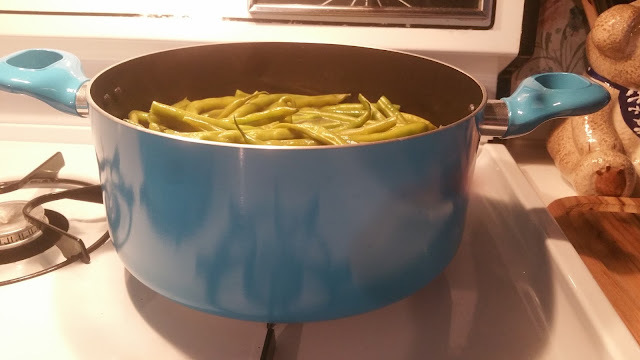 Saucepan w/ cover; 2 Qt. Saucepan w/ cover; 5 Qt. Dutch Oven; and 4 Measuring Spoons. 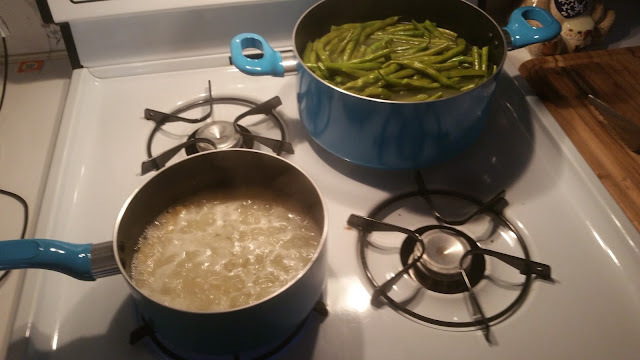 The 5qt Dutch Oven has well over 2lbs of fresh green beans in it and I still have room for more. I love that I can transfer from stove to oven as the T-fal excite cookwear set is oven safe up to 400 degrees! This set has quickly taken the place of our current set due to the quality and amazing features. T-fal is hosting a social media Back to School photo contest (8/10 – 9/7) which we would love for you to share along with the review/giveaway on your site. Using the #TfalBack2School Photo Contest, T-fal encourages consumers to take a photo of the room in their home that needs the most help getting organized for Back-to-School Season – across Facebook, Twitter and Instagram platforms. 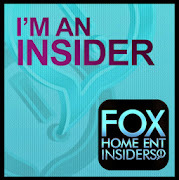 The winner will receive a suite of T-fal products and a Visa Gift Card, with a grand total valued at $1000. 5 runner ups will also win the suite of T-fal products to help clean and organize their homes! Party of 5 is giving away a T-Fal 7 in 1 Multi Cooker & Fryer valued at $99.99!! The new, revolutionary T-fal 7-in-1 Multi-Cooker & Fryer is a first of its kind appliance for the busy home cook. This multi-functioning product features 7 versatile cooking functions, allowing the user to fry, braise, sauté, simmer, brown, boil / pasta, and keep food warm. Product features such as the 1600W of power, 1.6 liter oil capacity, and 1.3 lbs. of food capacity ensure that you can cook any meal using just this one key kitchen appliance. The removable, dishwasher safe bowl with non-stick coating makes for easy clean up. The 7-in-1 Multi-Cooker & Fryer comes with a handy removable timer, allowing you to leave the kitchen without fear of not hearing the timer go off. It is the perfect accessory to ensure a perfectly cooked meal every time! I am going to cook fried chicken with seasoned french fries in this cooker. It looks amazing!! I'm thinking I might fry some shrimp, Louisiana style! I would love to cook sweet potato fries with this! Gosh looks like I could make anything with this. I'd try fried chicken. Fried vegetable rice and beans. Would love to cook chicken with this! Thanks for the chance!! I'd love to make some beef stew. Thanks so much. I would love to cook some homemade parmesan garlic fries in it! That is an awesome piece of equipment. I would make chicken in it! I would cook chicken breasts. I would make pulled pork in it. Some pan fried Red Snapper. I would cook a little roast with vegetables. I would definitely do chicken first. My kids love my chicken. I would cook jerk chicken, corned beef hash, chicken and dumplings , and french fries. I will make a chicken. I would first make sweet potato fries! I would cook chicken in the multi-cooker / fryer. I would cook chicken wings in my T-fal Fryer first if I won. I would make chicken and french fries. I'd cook breaded mushrooms and onion rings in it. Thanks. I would make braised chicken for the first time! I will be making fried chicken for my daughter. I would make spicy chicken wings and potato wedges. The first thing I would make is french fries. Would be great to fry fish in too. I would love to make some homemade french fries in this! I would make some bbq chicken and sweet potato fries. I would do Chicken also. I would make chicken a few different ways! Thank You for the giveaway… we would make a Guinness Beef Stew !